Foreword. Preface. Section I. General Introduction. Vision can make a difference: transboundary issues (G.E. Stout). A projection of the demand of water in the West Bank and Gaza Strip 1992-2005 (H. Awartani). Water management policy in Israel: a comprehensive approach (M.B. Meir). Reducing the risks of conflict over fresh water resources in the Middle East (P.H. Gleick). Palestinian water supplies and demands (N. Al-Khatib, K.K. Assaf). Management of Israel's water resources (J. Schwarz). A case for demand-side water management (T. Naff). Section II. The Jordan River Basin. Water utilization in the Yarmuk-Jordan, 1192-1992 (J.W. Eaton, D.J. Eaton). The relevance of Johnston Plan to the reality of 1993 and beyond (A. Soffer). The Arab-Israeli conflict over water resources (I. Mustafa). A budget of the surface and underground water in Northern Jordan (H.S. Salem). The legal-institutional issues involved in the solution of water conflicts in the Middle East: the Jordan (D.A. Caponera). Section III. Ground Water - the mountain aquifer and Gaza. An Israeli-Palestinian water-sharing regime (J.W. Moore). Eastward groundwater flow from the mountain aquifer (D.J. Scarpa). Groundwater allocation in Judea and Samaria (H. Gvirtzman). The development of the water resources of the occupied Palestinian territories: some key issues (D.R.C. Grey). International law and the mountain aquifer (E. Benvenisti). Approaches to the legal aspects of the conflict on water rights in Palestine/Israel (J. Kuttab, J. Isaac). Water situation in the Gaza Strip (I.R. Shawwa). The Gaza Strip water problem - an emergency solution for the Palestinian population (E. Ahiram, H. Siniora). Section IV. Developing Alternative Water Sources. Contribution of water imports to Israeli-Palestinian-Jordanian peace (G.E. Gruen). Costs of inter-regional conveyance of water and costs of sea water desalination (E. Kally). Replenishment of Palestinian waters by artificial recharge as a non-controversial option in water resource management in the West Bank and Gaza Strip (K.K. Assaf). Potential applications for desalination in the area (D. Hoffman). The role of reclamation and reuse in addressing community water needs in Israel and the West Bank (D.A. Okun). Reuse of waste water for irrigation in the West Bank: some aspects (M.Y. Sbeih). Fossil water under the deserts of the Middle East: a safeguard against strife (A.S. Issar). The Peace Canal Project: a multiple conflict resolution perspective for the Middle East (B. Wachtel). Section V. Approaches to Resolving the Water Conflicts. Economic and political adjustments to scarce water in the Middle East (T. Allan). A novel approach to the allocation of international water resources (H. Zarour, J. Isaac). Water sharing through trade in markets for water rights: an illustrative application to the Middle East (N. Zeitouni, N. Becker, M. Shechter). Water policy in the context of Palestinian self-government (A.M. Lesch). The allocation and marginal value product of water in Israeli agriculture (G. Fishelson). Economics, ecology and equity: lessons from the energy crisis in managing water shared by Israelis and Palestinians (D.B. Brooks). Towards an equitable distribution of the common Palestinian-Israeli waters: an international water law framework (S.S. Elmusa). An innovative institutional arrangement with potential for improving the management of international water resources (N.J. Dudley). Proposed principles and methodology for the equitable allocation of the water resources shared by the Israelis, Palestinians, Jordanians, Lebanese and Syrians (H. Shuval). The development of a water resource management infrastructure for the West Bank and Gaza (S.B. Parsons). Conflict over water in the Middle East: from a security and strategic point of view (A. Sabbagh). Legal aspects of international cooperation on transboundary water resources (A.J. Lässker). A general view of the water situation in the Occupied Palestinian Territories (OPT) (M. Mousa). Epilogue. The volume serves as an important mile-stone in the process called "second track" dialogue and cooperation between Israeli and Palestinian academics on crucial shared problems, the resolution of which is vital to the peace process. 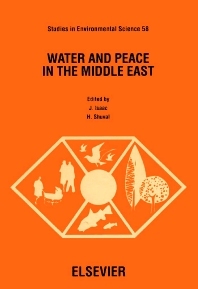 The book contains forty-one original papers dealing with almost all aspects of the Middle-Eastern water problems, and should serve as a useful reference to students, scholars and policy makers all over the world interested in understanding the complexities of the Middle-Eastern water conflicts.